The chaos resulting from Donald Trump’s Executive Order banning refugees from certain countries has dominated the news. But the implementation – this fly by the seat of your pants if you will, is indicative of the disorganization that plagued his entire campaign, and that should be disconcerting to Americans if and when this White House has to take the helm of an international crisis. Regardless of one’s feelings about the refugee ban, almost no one besides Trump and his Press Secretary Sean Spicer (who is of less public relations value to Trump than Jay Z.is to Beyonce), feels the roll-out was anything short of a disaster. In fact, when it comes to Presidential decisions, it might go down as among the most unmitigated doozies in history. That said, the Trump presidency is in its infancy and there are still opportunities to consult those who have – dare I say it, years of experience get future handling of key moments right. If they want to. First off, I’ve heard it said that Trump’s style is to delegate something and essentially expect it done. It’s consistent with his mantra; a businessman, a candidate of change with presumably means, among other things, ignoring protocol. But there’s a difference between getting what you want and having your goals flourish. And if this week is an indication, they are very mutually exclusive. Decisions that are as controversial, monumental and emotional as the travel ban require a presidential address. Or a news conference. Or a public speech. Perhaps even a town hall (I recognize the likelihood of booing and catcalls logistical handicaps to that). People need to know why something is so important for national security or what may be accomplished in 90 days. A stroke of the pen in matters like this and little else is not presidential leadership. But the lack of coordination hurt the most and it plagued Trump on the campaign trail again and again and again. The Executive Order came in a blink of an eye. Homeland Security Director James Kelly was in the midst of his first phone call on the subject when he learned it was literally being implemented. Defense Secretary Jim Mattis’s input was not sought. There was no coordination with the State Department, Justice, customs, border patrol or other critical layers of implementation. Neither were key members of Congress consulted and although we’re learning now that aides to the House Judiciary Committee were instrumental in the drafting, this was unbeknownst to the House leadership. Once issued, the world saw a plethora of mixed messages as to whether those who already had green cards would be exempt from the ban, if permanent residents visiting loved ones overseas were allowed back and even whether the refugees already approved would be let past the gates once they landed – or even if they should be allowed to board. That led to mass confusion in airports, and among anxious family members already at airports to pick up their loved ones who were detained. After hours of interrogation, many were given the go-ahead to embrace the American dream. Others, like the Assali family who had just won a 13 year battle to move to America, were sent back from Philly.were sent back. Meanwhile, the confusion continues to this day. Florida Senator Marco Rubio contacted the State Department in a futile attempt to get answers for constituents. He were told no answers could be given. But Trump shrugged it off, saying the airports were running “beautifully” despite contrary scenes on the television screens, at one point, actually blaming Delta Airlines for the disarray. Meanwhile, Spicer, said “the system worked really well” and that “everyone who needed to be consulted was consulted.” He then proceeded to note how only 109 international travelers out of 325,000 were detained (actually it was far more that were kept in limbo at worldwide airports). Lesson number two. Admit when you fouled up. Don’t act like everything’s hunky-dory when it’s in fact quite the opposite. Owning up and not obfuscating is a good way to not appear to be really out there. The same goes with the administration’s proclamation on the Holocaust Remembrance Day. I don’t know who in the White House drafted the proclamation (I have a feint idea and it’s not Jared Kushner) but I know it didn’t include the words “anti-Semitism” and “Jews.” This drew a wide rebuke from the Jewish community of both parties (to his credit, Mike Pence did mention the Jewish community in his own twitter page). Spicer shared his words of wisdom again by calling critics “pathetic” accusing them of “nitpicking.” Chief of Staff Reince Priebus, appearing on NBC’s “Meet the Press,” actually said, “I don’t regret the words.” The response drew a sharp rebuke from Trump’s Jewish supporters, including one of the most prominent, Shelly Adelson. Which brings us to lesson number three. Resorting to the “it’s the media’s fault” line may be a convenient target for obfuscation, but to the average American, it only goes so far time after time. if the Obama administration gets the blame for poor computer software for the Affordable Care Act from the right years after the fact, it’s only fair that the Trump administration share some blame for – to be generous, a lackadaisical approach for this issue. And if Obama can be blamed for leaving Iraq too quickly to honor a campaign pledge, Trump can be blamed for doing the same with the refugees without doing the proper due diligence. In February of 2009, just three weeks into his presidency, Barack Obama uttered the words, “I screwed up.” His nominee for Secretary of Health and Human Services, ex-Senator Tom Daschle had just withdrawn his candidacy after revelations that he was late paying $150,000 in taxes. For many, “I screwed up,” was an unheard of line from a Commander-in-Chief and the American people were taken aback that a president could be so humble in admitting of fault. Yet if the past week is any guide, it is likely to be unheard of for at least the next four years. The purpose of this column is not to put Barack Obama on a pedestal or to wax poetic about the past administration. His reign was far from perfect. But six days into his tenure as leader of the free world, Donald Trump has made waves and, while some of it is policy-related (imagine that), an astonishingly high percentage is not. That’s disturbing for a new administration fresh off a hard-fought campaign with responsibilities of governing and uniting the American people. After his claims were unequivocally debunked, Spicer appeared to back off though, he did not do what would have been the soundest, most moral and politically prudent strategy and apologize. Instead, Kelly Ann Conway appeared to double-down, even coining a new term for the American lexicon: “alternative facts.” But anecdotally, reports are that the President was upset about the crowd report because he wants to believe his administration and election is a movement. It’s worth noting that of course the crowds for President Obama would have been bigger. While every inauguration of a new president is historic, the fact that Obama was the first African-American to win the position added to its importance. So it’s only natural that more people would have turned out to see him. Another important fact: Trump’s inaugural fell on a Friday. Obama’s was on a Tuesday but it happened to be the day after the holiday of Dr. Martin Luther King, Jr., which means people had more flexibility with their schedules. Next is the president’s obsession with the notion that voter fraud cost him a popular vote win in the November election – never mind the fact that Trump was behind Hillary Clinton by almost 3 million votes. As a result, he is vowing to launch a Justice Department investigation into the matter. To date, there have been four documented cases of voter fraud – in Iowa (by an avowed Trump supporter no less) Texas, Illinois and Florida. There has never been the remotest piece of evidence of anything more widespread, let alone the fact that three to five million undocumented voters cast ballots for Clinton.In fact, I’ve heard Clinton supporters actually joke that “it was a terrible tactical error to rig the election in California but not in the swing states” (one creative tweet read, “apparently millions (were) sophisticated enough to figure out how to vote illegally, but not sophisticated enough to vote in states where it’d matter”). Republicans are distancing themselves from the claim as well. Now it’s one thing if Trump wants to look into voters being on the books in more than one state and have real and genuine election reform, but I’ll point out that Steve Bannon, Steve Mnuchin and the President’s own daughter Tiffany Trump are in that boat so I’m not sure what new revelations are going to come out of this new investigation. More importantly is his thin-skinned nature on relatively mundane matters. George W. Bush was pummeled by the press and if it bothered him, he showed few signs of it. Outvoted or not, this president should be grateful that the Constitution, by way of the Electoral College gives him the means to put his vision to work. When Trump wakes up in the morning, his first thoughts should be euphoria for being entrusted with opportunities to pursue his agenda because outvoted or not, each day gives him opportunities to do wonders for the American people (while of course debating the soundness and merits of the agenda). This seems like an apt time to invoke John Lewis. The Georgia Congressman and pillar of the civil rights movement has been the subject of Donald Trump’s ire lately but, allow me to point to a part of Lewis’s own background to put this insecurity thing into perspective. Several times, Lewis received apologies from members of the police force who beat him, including one who left him in a pool of blood in an Atlanta bus station. 50 years later, that man made a surprise visit to Lewis’ Washington office, apologized and asked Lewis if he forgave him and accepted his apology. Lewis said yes and hugged him (the pair has had many friendly encounters since). If Lewis can let go of that, surely the President could let go of the fact that he lost the popular vote. After all, Lewis had no rights in those days. Trump on the other hand has won the right to lead the nation. How he leads it is literally in his hands at this point. Yes, if Trump focuses on the issues that are important to the American people and does a good job, then in four years, he won’t have to claim voter fraud because he’ll win. The inverse is if he doesn’t, he may still raise it only next time, he won’t have the Electoral College to save him. The political world seems to be buzzing over a WBUR poll released recently that showed lukewarm re-elect margins for famed Massachusetts Senator Elizabeth Warren. While the poll found Warren’s approval rating to be 51%, it showed that just 44% of Bay State voters would grant her a second term. 46% felt it was time to “give someone else a chance.” Additionally, the poll showed Republican Governor Charlie Baker’s popularity exceeding Warren’s, making the GOP fish a safe bet in a fairly big Democratic pond. The poll was surprising to many who assumed that Warren would skate through the cycle and spend much of her time stumping the country on behalf of like-minded Democratic candidates seeking all kinds of offices. Does it mean she’s vulnerable or that the poll is wrong?The answer: probably neither. Everyone knows the expression, “you can’t judge a book by its cover.” Well, to paraphrase that, one can’t always judge a poll by its numbers, at least not this far out. Indeed, it needn’t be said that this is very early in a two year election cycle. Americans are still election weary and are not inclined to focus on any election, let one so far out. Having said that, Massachusetts is among the most liberal states in the nation and seems destined to be front and center in their opposition to the Trump administration. One could also argue that Ted Cruz should on paper face a grueling fight for re-election because his presidential campaign and personal style did not wear well with many others. Early polls may reflect the “someone else” sentiment. But Texas is Texas and at the end of the day, Cruz will be favored as well (though given that the demographics are changing, he might have to hustle more than Warren). And with so much emphasis on “someone else,” let’s look at it, shall we? A comment on the blog redracinghorses.com spelled it out succinctly. “Someone Else is usually a great candidate. Personally, I love his/her positions on the issues and he’s honest as heck. So it’s not unusual for a candidate to not do well against Someone Else.” The blogger goes on to say that “a real candidate is usually a different story. “ Indubitably! For Massachusetts, don’t be surprised if a “real candidate,” at least an “A” level candidate fails to emerge (Curt Schilling is making moves to run but he doesn’t seem to be causing Democratic operatives much sleep). For starters, the GOP is already gunning for five Democratic held seats that not only gave Donald Trump punishing margins, but Mitt Romney as well. Add that to the fact that Republicans now control all three levers of government and may be unpopular and it’s not unthinkable to think the GOP may not even target Warren. At the very least, any serious foe will have to raise serious money before national organizations pitch in and if the perception is that Warren is unbeatable, that will come to pass entirely. Remember in 2006, Republicans were hoping to tie Hillary Clinton down as she sought a second term in New York but, after ending up with a sacrificial lamb as a candidate and desperate to protect their own majority (unsuccessfully), that man, Yonkers Mayor Spencer was left fending for himself. Finally, let’s look at Senators who had so-so numbers going into their re-election campaigns. In August of 1993, <em>Roll Call</em> reported that Maryland Senator Paul Sarbanes had a 38% re-elect. But few of any stature sensed that Sarbanes was really vulnerable and he won re-election the following year – not a Democratic year by any means, with an 18% margin. A more important look may be Massachusetts itself. As venerable as he proved to be, there was a time very early in the 1994 cycle that Ted Kennedy appeared to be not so invincible. The Kennedy family had just come off a series of negative public relation hits and Kennedy was preparing to face an energetic businessman named Mitt Romney. But Kennedy, who narrowly trailed in early polls, took the race seriously and ended with a whopping 58%. The just completed cycle shows how difficult it is to predict vulnerability. At this point two years ago, Democrats were very concerned about Colorado Senator Mike Bennet while New Hampshire Senator Kelly Ayotte was thought to be reasonably positioned to win a second term. Meanwhile, the thought of North Carolina’s Rich Burr and Missouri’s Roy Blunt being seriously threatened was laughable. On the other side, some commentators saw Wisconsin’s Ron Johnson as toast – even more so than his neighbor, Mark Kirk of Illinois who was always thought to face an uphill fight (he would by 13 points). The end result: Ayotte lost, Blunt and Burr were pressed unexpectedly hard while Johnson stunned almost all of Washington and beyond by holding his seat by a fairly comfortable margin. In the fall of 2009, one political analyst called my thoughts that seemingly entrenched three-term Senators Barbara Boxer, Russ Feingold and Patty Murray might face challenging races the following year “truly bizarre.” Feingold ended up losing, Murray barely squeaked by and Boxer, while winning comfortably in the end, was in a fight for her political life almost the entire year. But the most important reason for Warren’s strength is the political environment. Massachusetts was the one state that opted for George McGovern over Richard Nixon in 1972 and while, last year displayed that states that proved durable for one party at the national level can certainly change, Massachusetts isn’t likely to be going down that path anytime soon. In other words, Warren can probably continue to book flights to other states confidant shell continue to be the top draw. Friday is inauguration day. The swearing-in of a new President signifies the peaceful transfer of power – one of many things that makes our nation unique. We’re talking about the start of an era though, to hear many tell it, one may think it’ll be the start of an error. That extends to than 65 Democratic members of Congress (at last count) including the venerable John Lewis will not be attending the ceremony. That is certainly their prerogative. But it is also a mistake. Let me make clear. John Lewis may be the one person in Washington D.C. who can preach of moral superiority who can probably emerge unchallenged. It is universally agreed that he lacks a mean bone in his body. 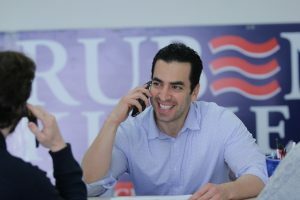 His stature in the House, not just in the Democratic caucus but among very conservative members, is nearly unheard of. I also think that the president-elect calling Lewis “all-talk” was dead wrong. I also felt that while Trump has been gracious to some of his political opponents, it would have behooved him to meet with some of his detractors such as Mr. Lewis or Khizir Kahn. But we’re talking about a new chapter, it’s far easier to catch flies with honey than with vinegar and boycotting the inauguration just increases the rancor. Losing is not fun. I told Democrats the day after this past election, just as I did after the election of 2004 to not look back – to just look ahead. Introspection and examining mistakes is one thing but, look to the future. We all know that the Russians attempted to interfere with our elections and that’s disturbing. But little suggests they succeeded in changing actual votes cast. Donald Trump is going to be taking his oath at noon tomorrow under the capitol dome – the time mandated by the U.S. Constitution. It’s hard to get much more legitimate than that. There’s a reason that takes place at the capitol. The design is the president and the Congress. Let’s examine the boycott. While I consider the reasons of the members not attending to be legitimate and their views profound, boycotting an inauguration sends the wrong symbol about our democratic mores while also setting a very unwise precedent for the future. The office of President of the United States is not about one man, it is about our nation. When a crisis occurs we only have one President and we get behind that person. Tomorrow, that person will be Donald J. Trump. To put it another way, there’s a difference between not respecting the president and not respecting the presidency. Consider: Hillary Clinton is the vanquished opponent after a very rough campaign yet she is graciously attending. That should say wonders about the fabric of our government. For members of Congress, the inaugural ceremony is just one example. The State of the Union is another. The president is required to provide an annual message to Congress on the status of national and international affairs. One doesn’t have to heartily applaud but being on hand is really a responsibility. Now I’m not saying folks on the other side of the aisle – at any time, should grin and bear it. Unlike some, I consider protests as American as apple pie and a central part of our democracy, not to mention a necessity for advocacy of views. That applies to members of Congress as well as Joe Q. Citizen. But by all means, tomorrow is a rite of passage that defines what the Constitution is all about – “We the People,” and it should be treated as such. For tomorrow at least, that would be a sound philosophy for members of Congress, Democrat and Republican alike. It has long been assumed that House Republicans are safely ensconced in the majority at least until the next round of redistricting following the 2020 census. Those odds have left many Republicans gleeful and Democrats bereft that, with the Senate geographically out of Democratic hands until ’20 (a 50-50 split seems to be their best option at this point), there would be no way for voters to formally demand checks and balances on the Trump administration. Only, the House is not as far from reach for Democrats as many think. While Republicans do have a comfortable edge – 24 seats, a state-by-state analysis reveals that a Trump administration mired by low ratings could put the House in Democratic hands. Let me preface this by saying that no matter how Americans view our president-elect, no one shall be openly rooting for anything other than success. That said, history shows that a president’s party nearly always loses Congressional seats in mid-term elections, and often (in 1982, 1994 and 2010) a substantial number. If a recent <em>Politico</em> piece is believable, many voters are vowing to hold Trump accountable should he not deliver. So if unpopular policies, Trump’s non-phlegmatic disposition or the lack of a coherent message among administration players makes the Trump administration very unpopular – and the current low ratings suggest that there is that possibility, it won’t be super-hard to flip the requisite number of seats to deliver Democratic control. That’s not to say it will be easy – incumbency and money still loom large and, even before Trump’s surprise win, it was clear that many GOP incumbents were succeeding in convincing voters to give them the benefit of not necessarily being tied at the hip to Trump even though he shared their ticket. The difficulty of this repeating in 2018 is that Trump will be the incumbent which means if voters are disillusioned, the President and Congressional Republicans will be inextricably linked. Which means if voters do want divided government, the seats will be there. One only has to look at what I call the “Hackett near miracle” to see what is possible. In 2005, Iraq War veteran Paul Hackett embarked on a long-shot bid to succeed Rob Portman, who had resigned to take a post in George W. Bush’s cabinet. The president had captured 64% in the district nine months earlier but Americans were just beginning to grow weary of the war and the mounting casualties. Hackett had a sharp message and came within 4,000 votes of winning. Let’s go back to that 24 seat number for a moment. Many Republicans sit in districts that, through gerrymandering, huge financial edges, and the benefits of incumbency, they can hold indefinitely. But they are not “safe” Republican by any means, as not only did Barack Obama carry many them but so did Clinton. To put another way, while voters were opting for Trump because they believed in a key component of his message, the bond was fragile. Now let’s look at how Democrats can make up the gap. There are 10-12 seats in Pennsylvania, Michigan and Ohio alone that could be ripe for the taking, as these are states that have among the most gerrymandered Congressional maps in the nation. Among the incumbents that could be tied down: Ryan Costello and Brian Fitzpatrick of Pennsylvania, Justin Amash, Mike Bishop, Tim Walberg and Dave Trott of Michigan and Dave Joyce and Jim Renacci of Ohio. If many did become Democratic pickups, even for one term, it would not be unlike what transpired in the middle of the last decade as Democrats seized seats specifically drawn for the other side. Many of these seats were targeted last time but now, there will be a referendum on Mr. Trump’s performance. Moving on, at least four districts in California and two each in Colorado, Florida, Iowa, and Minnesota lean Democratic at least to some degree while two others in Virginia and Maine’s Second district are decidedly mixed (there is one such district in Arizona). New York State has as many as six GOP held seats that could easily flip. It begs mention that in the 2006 and ’08 cycles, Democrats flipped three seats each, reducing the number of Republican members of Congress in the delegation to a mere three, a number that plummeted yet one more when Democrats picked up a Watertown-Plattsburgh area seat in a 2009 special election that had been held by a Whig more recently than a Democrat. Other seats would be tougher nuts to crack – but by no means impossible. One, Kansas-3 came fairly, though not heart achingly close to flipping last cycle but Hillary Clinton carried it. In Utah, Mia Love was able to put comfortable distance between a very tepid win in 2014 and a double digit margin last year, but she is by no means ensconced. North Carolina is the arch-prototype of conservative resistance but even there, at least one seat – the state’s 13th district, held by a very conservative newcomer, Ted Budd, is less than safe. The cornfields if Indiana are tougher but a St. Joseph/Elkhart district in the Northern part of the state and a rural Bloomington anchored district in the Southern part are no means certain to stick with either their GOP Congress people if Trump is genuinely unpopular. In Washington’s Fifth Congressional district, Cathy McMorris-Rodgers could struggle. In Alaska, the dean of the Republicans in Congress, Don Young, has won his last couple of cycles by unimpressive margins and an anti-GOP tide can knock him out. Finally, Democrats may try to persuade ex-Congressman Brad Ashford to try to try to reclaim the fairly competitive Omaha area seat that he won in a bad year for his party (2014), only to lost by the barest of margins in November. The election returns in Georgia even, on paper at least, suggest Democrats might have an opportunity or two in the suburban Atlanta area. Recent history has proven that seats don’t have to lean reliably to one party or another to flip in a bad year. One of the California seats I cited was Darrell Issa’s. Though the San Diego-Orange County district is not as reliably Republican as it once was, it still is a tough hoe for Democrats. But Issa held his seat this past year by just 1,500 votes after a protracted count that dragged past Thanksgiving. In the wave year of 2006, Arizona’s J.D. Hayworth, New York’s Sue Kelly and Pennsylvania’s Melissa Hart lost seats that George W. Bush had carried two years earlier. Ditto for Ric Keller in Florida two years later. Even a seat as fertilely Republican as J. Dennis Hastert’s went Democratic in a 2008 special election following his resignation. The climate made it possible. Similarly, in anti-Democratic 2010, scores of lawmakers lost in districts that were mixed or even Democratic leaning. These included longtime barons such as Jim Oberstar of Minnesota and Paul Kanjorski of Pennsylvania and newcomers like Pat Murphy and New Yorkers Dan Maffei and John Hall. Very few seats were on the other party’s radar even months before the election which means that, who knows where a few more vulnerables will be found (Texas)? In closing, the House at this point is still Republicans to lose but, if voters genuinely want a two-party government, a Democratic House could very much be in the cards. This week, New York City lost an icon. He wasn’t as universally notorious as Wall Street or Fifth Avenue nor even the Carnegie Deli, which also shut its doors but to longtime New Yorkers, his name was as recognizable as any landmark. His depth was not the Empire State Building or the Brooklyn Bridge but his bravery was. Ditto for his strong spirits, his wit and his power to forgive. The man of course is Detective Stephen McDonald who died earlier this week 30 years after being gunned down by a robber and confined to a wheelchair for life. He was two months shy of his 60th birthday. McDonald, a Central Park station house cop and Navy veteran, was paralyzed from the neck down after being shot by one of the two young teenagers he had confronted who “looked suspicious.” One, Shavod Jones, proceeded to shoot him three times and one of the bullets hit his spine (another was lodged in his throat which would impact his speaking ability. Indeed, refusing to go off-duty (he was promoted to detective in 1995), McDonald became a voice for the aspiring. He addressed police graduations, spoke to students and literally became an ambassador of goodwill. Astonishingly, that gesture extended to his own assailant. As his recovery was in its early stages, McDonald said that he had no animus toward Jones, saying,“I forgive him, and hope that he can find peace and purpose in his life.” He expressed hope that the duo could give lecture together focusing on forgiveness. That would never come. Jones was killed in a motorcycle accident after his release from. prison. McDonald was bereft. But he wouldn’t stop trying to help others. 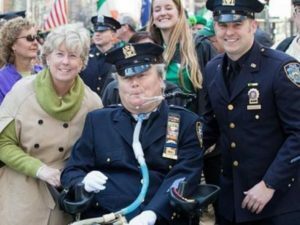 He became the first disabled person to participate in the St. Patrick’s Day parade – though under the stipulation that other disabled groups be allowed to participate as well). He journeyed to Israel, Ireland, Bosnia and other war-torn nations. Meanwhile, Patti Ann gained some stature as well. She became Mayor of the Long Island village of Malverne in 2007, a position she holds today. Through it all, he kept his humor. Asked if he’d do anything different if he had it to do over, McDonald quipped “duck.” Meanwhile, his family was everything. Having hailed from an Irish-Catholic family of eight children, it would be extraordinary for McDonald to be seen without Patti Ann, often with Conor by their side, and almost always in uniform (Patti Ann herself has been described as a saint in recent days). 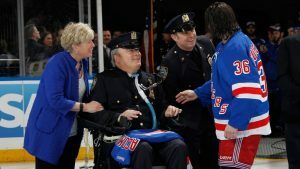 Speaking of family, McDonald received many gifts but his biggest might have been Conor’s decision to become a cop, just like the daddy he almost never knew. It was only natural as McDonald’s father and grandfather were both city police officers (the eldest Detective McDonald was himself wounded while apprehending a suspect in 1936). In the song, “New York, New York,” Frank Sinatra’s immortal words are, “if you can make it here, you can make it anywhere.” You made it Detective. And just as when a hero falls an angel rises, you’ll be soaring above the city you love and protecting it through the ages. Donald Trump’s impending inauguration and the inevitable clash over filling Antonin Scalia’s Supreme Court seat forces us to take a look at the institution. Regardless of the opinions that people will have about whomever the president-elect nominates – and one can rest assured that there will be many, both visceral and glowing, how will the partisan navigations used to support or derail Trump’s nominee impact a healthy democracy. The answer: probably not very well. First of all, the institution has been badly damaged over the years by hyper-partisanship over federal court nominees, cabinet nominees, and frankly, nearly everything else trivial or gargantuan. Some of the reasons are enacting political goals, others revanchist but in many cases, one-upping the other side. And it is by no means limited to the Senate. Last week, the Machiavellian atmosphere very nearly led to the gutting of the independent office that screens ethics complaints against members of the House. But court fights typically take center stage and the consequences are ominous. So too are the consequences of the integrity of the Senate. As I’ve written many times (primarily in this publication), the slow-walking and outright stalling of non-controversial nominees has hurt the efficiency of benches nationwide which has created a backlog of an unnecessary delay of justice. In the last Congress, Senate Majority leader Mitch McConnell allowed just 22 nominees to be voted on, leaving vacant 114 slots, including 42 that are categorized as judicial “emergencies” (not every slot has nominees but that’s hardly the point). Again, these were “non-controversial,” nominees – hence, they were poised to be confirmed near unanimously if ever brought to a vote. 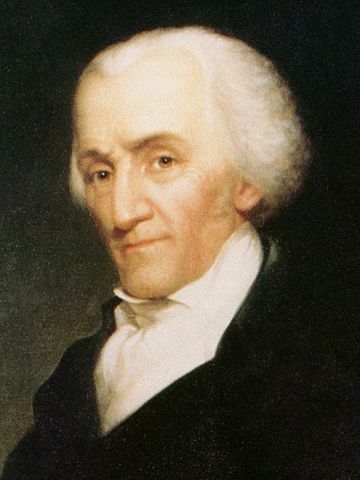 So keeping these slots open – some for as long as two years, is just a display of mean-spirited avariciousness that is really abusing not simply what the Founding Father’s intended but also the prestige of the U.S. Senate. Democrats by contrast confirmed 10 Bush nominees for lifetime appointments en masse even though it was just two months before the 2008 election. Conversely, in 2013, Senate Republicans balked about Democrats eliminating the filibuster for all but Supreme Court nominees in the 113th Congress. This again was done to thwart the ridiculous abuse of the filibuster by Republicans at cabinet and judicial nominees. Republicans responded by citing the fact that the filibuster had been in place for more than 225 years and, that is a valid assertion. But that only forces people to think of how democratic the filibuster is and whether the gridlock it creates is truly worth it. Again, its intent upon creation was to stop a nominee on extraordinary circumstances but it was abused to the point that it had to be gotten rid of eventually. Republicans spoke of doing so many times – Democrats simply blinked first. Now let’s look at the elephant in the room – the SCOTUS seat. Senate Minority Leader Chuck Schumer vowed recently that he would “absolutely” not hesitate to hold the seat open, adding “It’s hard for me to imagine a nominee that Donald Trump would choose that would get Republican support that we could support.” Schumer also appeared to go a step further, vowing, “We are not going to settle on a Supreme Court nominee.” In the longrun, that could be problematic. Schumer and other Democrats were harshly critical of their Republican colleagues not allowing Obama’s ill-fated nominee, Merrick Garland, receive a hearing – much less a vote, following Scalia’s death. Allow me to break down the soundness of these two juxtapositions. Though some have quarrelled with the notion of leaving a Supreme Court seat vacant for nearly a whole year prior to a major election, I don’t particularly have a problem with it. I’m not saying it’s ideal. But you couldn’t put a gun to my head and make me vote to grant a lifetime appointment to a high court nominee with views completely antithetical to my own, particularly right before I might have a chance to get someone more to my liking so, that goes both ways. I’ve had friends who share my politics disagree with me but, that’s just the way it is. But holding it open for four years is an entirely different animal. Now Schumer is a master tactician – he knows what he’s doing. But not filling an appointment at all is neither healthy for the institution or democratic mores (and I emphasize the lower case “d” in democratic). Filibusters are fine for an incredibly tainted nominee. Hell, if the President-elect nominates ten Clarence Thomases, than Democrats should mount 10 filibusters. But if he nominates one or two Thomases then follows it up with someone generally agreed upon to be of sound mind with mainstream views and competent qualifications, Democrats would be wise to not block it. I’m not saying most – including Schumer itself should vote for that person on the Senate floor if they are not assured he/she doesn’t share their priorities, but at some point, filibustering them to death for four years will not be looked upon favorably by the American people. During the 2004 election cycle, President George W. Bush hit hard at Senate Democrats for “blocking” his jusdicial nominees. Never mind that they had held up a mere ten that they considered to hold extreme views and never mind that they had let more than 200 other nominees through without nary a whimper. Republicans hit hard at the “blocking” and it was pivotal in costing Minority Leader Tom Daschle his Senate seat. Consider this. Mitch McConnell was rightfully villified for saying his sole objective was to make Barack Obama a one-term President. During the 2018 mid-terms – and even the ’20 midterm campaign should Trump be a candidate, Republicans will not think twice about morphing Schumer’s words into an ad. My lesson. Pick your battles carefully. There will be other elections. But doing so would be a profound weakening of the institution which will mean an inevitable, and an unhealthy paradigm shift. In other words, winning is fun but there’s no such thing as winning without consequences. And as an addendum, it does matter how you play the game. This week, the 115th Congress gaveled to order in Washington D.C. While the partisan make-up hardly shifted from the last Congress, the racial and ethnic caucuses that make up Congressional member organizations can boast of slight upticks in their numbers. While the gains among women in Congress were tepid if only barely existent (female membership in the House actually dwindled by one), the Senate might be indicative of the wave of diversity that is slowly expanding within the marble corridors. Three of the four new female Senators, all Democrats, have twin ethnicities which add to the ranks of multiple caucuses in the body. Tammy Duckworth, whose father is Asian, picked off incumbent Mark Kirk while in California, Kamala Harris, who is of both Indian and Jamaican descent, will replace Barbara Boxer. Meanwhile, Catherine Cortez-Masto, who boasted that her mother was Italian but father Hispanic, will be the first Latina to serve in the Senate. 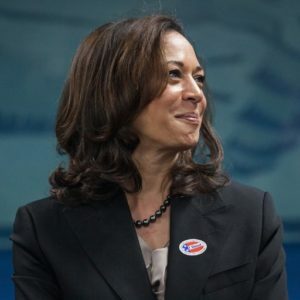 The elections of Harris and Cortez-Masto means African-Americans and Hispanics will now compose three percent each of the upper chamber. They, along with Maggie Hassan of New Hampshire, will mean four new females have joined the Senate, but because three retired or were defeated, the ranks of women serving have only increased by one, to 21. Female members of the House decreased by one – to 83. But there are a few notables. Former Vice-President Richard Cheney’s daughter Liz now holds Wyoming’s At-Large Congressional district first won by her father in 1978. But having succeeded Cynthia Lummis who in turn had succeeded Barbara Cubin, this may mark the first time in history that three women have held the same seat consecutively. 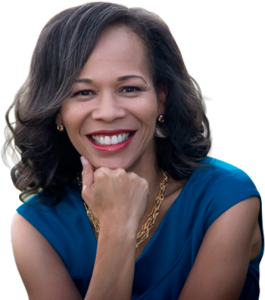 And in Delaware, Lisa Blunt-Rochester pulled off a stunning win for that state’s sole Congressional seat, becoming the first woman to represent the “First State” in Congress. It also leaves Mississippi and Vermont as the only states that have yet to send a woman to Congress (though Vermont did elect a female Governor three times in the 1980s and Mississippi has elected several female Lieutenant Governors). The ethnic caucus also produced at least one tidbit that borders on paradoxical. In Texas’s 23rd Congressional district, an African-American, first-term Republican Will Hurd, narrowly hung onto his job by defeating a Hispanic in a district drawn to favor that ethnicity – the former Congressman he surprised two years ago, Pete Gallego. And in California’s 44th district, Nanette Barragan, a Latino, beat an African-American, Isadore Hall in an area that favored African-Americans. Overall, the Congressional Black Caucus netted two new House members, fairly standard for the middle of a decade absent the full-scale creation of new districts via redistricting. Florida and Virginia did redraw last cycle and it did have an impact (Val Demings and Don McEachen benefited from a court-ordered redraw, as did Al Lawson, though he defeated Democratic incumbent Corrine Brown. In Maryland, Anthony Brown succeeded fellow CBC member Donna Edwards, Philadelphia replaced another member, scandal-tarred Chaka Fattah with Dwight Evans while in Delaware, Blunt Rochester scored a big win to claim the seat for the CBC. If the net increase of African-American members in a single election met the expectations, the increase of Hispanics members unpacking their bags in Washington D.C. has exceeded them. Congress has seen a net gain of six Latino members, though the sole Republican, Brian Mast of Florida, has not indicated plans to join the Congressional Hispanic Caucus. Two members, Lou Correa of California and Vincente Gonzalez of Texas succeeded Latino members who departed Congress (Loretta Sanchez and Ruben Hinojosa respectively). But Salud Carbajal replaces Lois Capps while Ruben Kihuen of Nevada unseated GOP Congressman Crescent Hardy, thereby becoming the state’s first Latino member of Congress. In addition, Darren Soto snagged an Orlando seat, defeating the wife of the man he was aiming to replace Alan Grayson (the win makes Soto the first Puerto Rican member to hail from Florida). Finally, Adriano Espaillat has proven that the third time is indeed a charm, having mounted two agonizingly close but unsuccessful primary bids to unseat the ubiquitous and iconic Charlie Rangel. The incumbent made good on his pledge to retire at age 86 and Espaillat’s third primary was equally close but this time, he prevailed and, as the first Dominican Congressman, has already made history. The Asian Pacific American Caucus especially did well. Duckworth gave up her House seat to compete for the Senate but her successor is Raja Krishnamoorthy, an Indian American. Mike Honda fell in a Democrat vs. Democrat race in California but the man who beat him was Ro Khanna, an Indian American. And Colleen Hanabusa reclaimed the seat she gave up two years ago for an unsuccessful Senate bid, replacing a fellow Pacific Islander, Mark Takai who died of cancer last summer. Two new members replaced Caucasians. In Washington State, Pramila Jayapal won a seat vacated by Jim McDermott while in Central-Florida, Stephanie Murphy, a Vietnamese born Democrat, outhustled a big-fish in Congress, one-time Transportation Chair John Mica. Even after a court-ordered redraw increased the Democratic performance of his district so that President Obama actually won it, Mica wouldn’t even hire a campaign manager. The seven member LGBT Caucus will remain at seven, as Angie Craig, the sole gay candidate who had a strong chance of joining Congress, ultimately fell short in a close race in Minnesota. She may well try again in 2018. Finally, the number of Jewish House members increased by five and like everything else, an interesting tidbit is at hand. Shelby County, Tennessee (Memphis) can now boast not only of two Jewish members, but two who attend the same synagogue. But that’s where the similarities end. Returning member Steve Cohen is among the most progressive Democrats in his caucus while newcomer David Kustoff is a staunch conservative. Both are acquainted but not particularly friendly. Other new Jewish members include Brad Schneider (Illinois), Jamie Raskin (Maryland), Jacky Rosen (Nevada), and Josh Gottheimer (New Jersey), all Democrats. New York Democrat Steve Israel retired. The winners and losers from the next round of redistricting will be known in four years almost to the day but, it’s never too early for political junkies such as myself to start looking ahead to scenarios that might cause an ever-so-slight shift in the balance of power. One state that captures my imagination is Illinois. The “Land of Lincoln” will definitely be losing one of its 18 Congressional seats but population trends signify that dropping two seats is not out of the realm either. In fact, the state was one of eight to suffer a population loss in 2016 as residents continue to pour into the South and West – and this is the third year in a row. It is under that premise that I will assume a two seat loss is likely and explore a scenario for a map that might result. I am also going to assume – and it’s admittedly a big one with an election two years ago, that Republican Governor Bruce Rauner, will be a one-termer. Though he has vowed to put $50 million into his war-chest to win a second term, his job approval is not particularly strong so, I will foreshadow a takeover. If not, I’ll have some revisiting to do but that would portend good news for Democrats. First of all, I am a believer in good government and therefore, am an ardent proponent of, if not fair redistricting, than ending the hyper-partisan remap that has paralyzed Congress. But, until Republicans cease using their control of states like Texas, Pennsylvania, Michigan, Ohio, North Carolina and Wisconsin, among others, to take the whole cake, Democrats shouldn’t hesitate to return the favor in states they have. To do otherwise would be unilateral disarmament. That said, let’s look at the lay of the land. The Congress that convened earlier this week consists of a delegation of eleven Democrats and seven Republicans. Democrats in 2011 did draw the map to have 13 Democrats and five Republicans and at one point in the decade did get as many as 12 (they fell 1,002 votes shy of cracking the 13th in 2012). Most analysts think that while a few may face serious challenges (Democrat Bob Dold in the 10th and Republican Mike Bost in the 12th), the 11-7 number should hold until the ’22 redrawing gets under way. Population-wise, Cook County (Chicago) has seen an ever-so-slight decrease but the parts of the city declining and thriving is stark. The drop mostly stems from Barack Obama’s home-turf on the south side. Conversely, the Loop is trending upward while the ring counties – Will (Joliet), Kane (Aurora), Kendall (Yorkville) and McHenry (part of the Fox Valley River) have been growing at a healthy clip. Not surprisingly, rural, and poor southern Illinois has seen a substantial drop. That’s where we shall begin. Republican Rodney Davis represents the 13th district and that could easily be carved up among its three Republican neighbors. Mike Bost represents the 12th district which encompasses the southern tip up through East St. Louis and swerving through a few central counties. The 15th, held by John Shimkus meanders from the Kentucky border to central Indiana. The 18th, which Darren LaHood recently won, takes in the central and western part of the state That would seem to put Davis out of a job except, Shimkus has talked about retiring since as early as 2008 and, having been passed over to chair the House Commerce Committee a second time, and Davis would be combined, as Southern Illinois is most rapidly losing population. Shimkus may not still be in the House. He’s talked about retiring endlessly and, having been passed over a second time for Commerce, may retire. But if it’s he and Davis, he’d almost certainly let his former aide have it. The other district is more difficult but my guess is Hultgren’s would be divided among its neighbors. It might make the surrounding areas less safe for the Dems (though Foster can get Aurora) but Kinzinger and Roskam can encompass the other GOP areas. The Three Chicago majority-black districts, held by Democrats Bobby Rush, Robin Kelly and Danny Davis will have to expand further into the suburbs to not only account for their own population loss, but also to pick up some of the people that will be displaced from the loss of two statewide Congressional districts. Because these districts gave Hillary Clinton 75%, 78% and 87% respectively, even a 10% drop in Democratic performance will not keep these from being anything less than utterly safe seats for the party, though whomever holds the seats may have to exert a little more energy in a primary than previously accustomed too. Similarly, by shedding some of their Democratic precincts in 2012, Jan Schakowsky and Mike Quigley took one for the team by helping their party pick-up marginal districts. With the Democratic showing still at 65% minimum, they could and probably would agree to drop it 2-3% further and still continue winning without breaking a sweat (Schakowsky’s precincts in particular would shore up Brad Schneider who won in 2012, lost in ’14 and then came back this year). Now things get more complicated. The next district that Democrats would probably carve up would be the 14thdistrict. Once represented by Speaker Denny Hastert, Randy Hultgren put the seat back in the GOP column in 2010 and he has held it comfortably since. The boundaries of most of the district are on either side of the 14th encompass the 6th and 16th districts which also are conveniently represented by Republicans (Peter Roskam and Adam Kinzinger respectively). So those two seats could gobble up at least most of the territory. In turn, Kinzinger would shed a handful of his counties to the 15th district (Shimkus) but more to the 18th, held by Darren LaHood, both of whom also happen to be Republicans. Tiny Ford County encompasses two districts and now can solely be served by the 15th. In order to accommodate this, a few near-solidly Democratic districts will probably have to become a point or two more Republican but, even in a wave year that works against them, should not cause great pain. That said, I want to focus on the district of Cheri Bustos (the 17th), the lone Democrat outside the Chicago-metro area, because that’s where enormous shifting will take place. Obviously, a two seat loss means the 17th will have to grow as well. One solution would be for the cities of Peoria and Rockford, now in different districts, to be reunited (until the final redraw, Rockford has not had two separate members of Congress since 1850). There is a reason. 14 of the 20 eastern Rockford wards were carried by Donald Trump and Republican Senator Mark Kirk won most of them by nearly double the margin in their double digit statewide losses. But Clinton and Duckworth won a few also so while Bustos would probably have a net loss of a few thousand votes, it wouldn’t be anything catastrophic. Plus, her own Rockford wards aren’t all that reliable. While winning re-election 60-40%, she barely carried wards 27 and 31 while losing 28 and tying in ward 3. Obviously, more shuffling would be required as well. Bustos could pick up small counties such as Stark (population 5,097) from Kinzinger and Hancock (18,097) from LaHood while giving LaHood counties such as Henderson (6,990) and Warren (17,726) which opted for both Obama and Trump but only opted for Bustos by a nominal margin this year. The bottom line: Bustos, who has been talked about as a Gubernatorial candidate this year, might have to fight a little harder in a bad Democratic year but a working class candidate always has an edge. Finally, if the Democrats really wanted to be bold, they could draw the 17th to Democratic parts of Springfield as they did last decade but that would be aesthetically (and perhaps Constitutionally) grotesque. Democrats have also spoken of linking the university towns, namely Champaign, Carbondale and Bloomington) but that would be risky with a two seat loss. It could be attempted if the state were to lose a single seat but, given that so many Republican areas buttress them, a win would be no sure thing. In just 25 short days, President-elect Donald Trump sheds the elect and takes office as our nation’s 45th president. With much of the transition period behind, I have a number of thoughts. I will not focus on the quality of the appointments that have been made, but rather, on my concerns with what has not been done. But I also want to address a matter equally concerning that is evidently not taking part in the transition – Mr. Trump’s temperament and his continued affinity to let loose and settle scores via twitter. First for the appointments. Trump has yet to name an Intelligence Director and a Director of the Office of Counter Terrorism. Lisa Monaco, the outgoing Director of the latter has even publicly lamented the fact that she is more than ready to sit down with her successor – if only one would be named. This is a must. In the age in which we live, that is a real problem but, more so for a man who lacks experience in government or international affairs. It’s not the end of the world if an Agriculture or Trade Secretary isn’t in place come inauguration day. Those department have many bureaucrats and people with firsthand knowledge who can keep things running (no disrespect to the bureaucrats). But national security cannot be carried out on a tightrope. The most important responsibility of a president is to keep his fellow Americans safe. Some contend that it is “preserving, protecting, and defending” the Constitution as the oath states and of course that is the case. But without one, the other cannot exist. Therein lies the problem of his having taken limited – if not minimal, intelligence briefings. Trump contends that the subject matter is repetitive and that his vice-president to be taking part in these briefings. That’s not enough. At the end of the day, Mike Pence is not going to be the one making the decision – Trump is. Some of those decisions will have life and death consequences. Trump is the first to admit that he is a political rookie and when a rookie is mere weeks away from being handed the Oval Office, he has to know the lay of the land. Next, until he gets firmly situated in the Oval Office, Trump needs to put a moratorium on his tweeting. It’s not that tweeting per se by a president-elect is bad. In fact, in many cases, it’s refreshing. but setting wide-reaching policy – in some cases breaking decades of precedent and unwritten rules, in 140 characters, is not a way to introduce these policies to the world. So far, the president-elect has set off a firestorm with a single tweet on China as well as the possible need for “a new arms race.” A President-elect can’t compose a series of tweets – even with an attempted clarification later, without major repercussions on the world-stage. I realize that Trump, by his own admission, was for the most part not expecting to win the election so, I understand old habits die hard. That’s human nature. But with the campaign having been so divisive, Trump’s first mission should be reassuring the American people that he is fully up to the job – and this tweeting from the hip is not the way to carry this out. The bottom line: after Trump is in office for an extended period of time – six months to a year, and Americans get a taste of his governing style, then perhaps he can tweet to his hearts content. But for the first few months of his Presidency, he ought stick to more generic things such as holiday greetings or congratulating sports teams, etc. Finally, Trump needs to stop trying to be flippant about the fact that he lost the popular vote. It exists just as prominently in the Constitution as the Electoral College – only the electoral college is what counts. One can see that bothers him a great deal but at the end of the day, it is he who is going to take the oath of office on the steps of the U.S. Capital, not Hillary Clinton. Inevitably, some will try to second-guess him and delegitimize his presidency but, like the Electoral College or not, his legitimacy as commander-in-chief is protected under the Constitution. What is being delegitimized is his attempt, by virtue of his saying that he won because he chose the right states and Hillary Clinton didn’t, is people who live in certain states. Newt Gingrich concurred saying the person with the most yards don’t always win the games. The rules are the rules but putting it in such cavalier contexts has a way of making Americans in those states seem like second-class citizens. Agree with the electoral college or not, that is clearly not what the Founding Fathers envisioned. Oh, and one more thing. Mr. Trump doesn’t have to keep taking aim at Clinton – and Obama, if even feebly. Your former opponent has been very gracious in defeat and totally silent. Shouldn’t you reciprocate? The President, by Trump’s own repeated admission, has gone out of his way to conduct a smooth transition. Responding to his notion that he could have won a third term is an unnecessary distraction from what should be far more important priorities, particularly since Obama was speaking more generally rather than actually mentioning Trump by name. C’mon, sir.After all, it’s the time of year when the world falls in love. If you remember that as you get ready to assume the most powerful mission, everything will turn out Trumptastic.